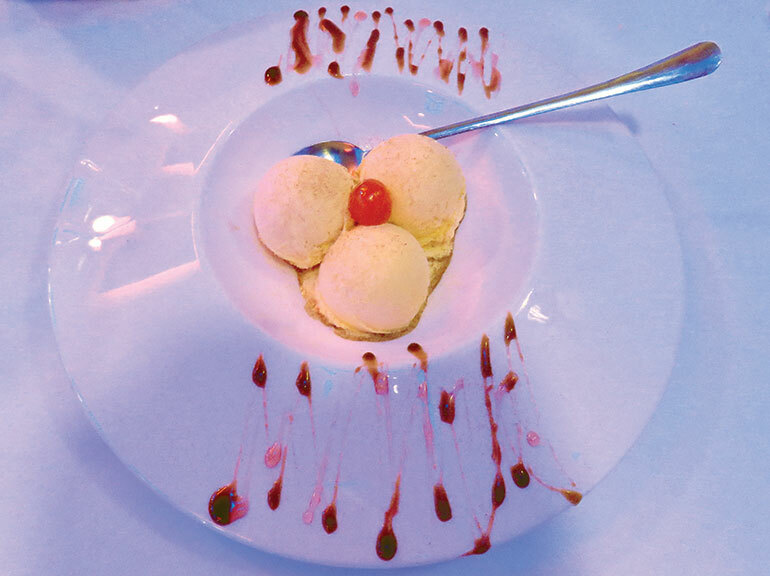 When a symphony of colour arrives at your table, it heightens your appetite. 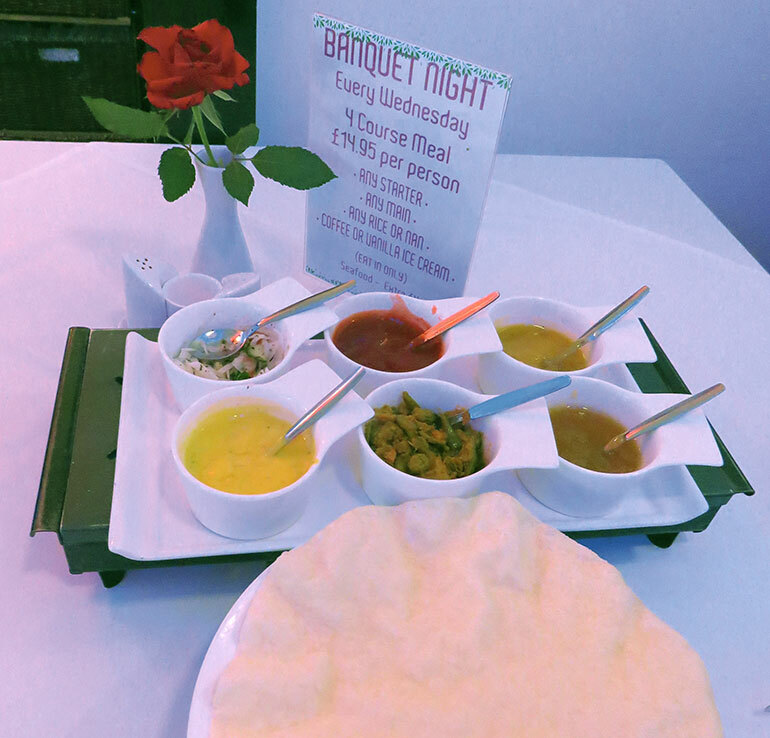 Dipping pieces of poppadums in and out of an assortment of eyecatching and tasty pickles and sauces was the perfect way to start our Indian meal. It also kept us busy whilst waiting for our appetisers. Sobzi Puree (mixed vegetables cooked in a Bhuna sauce wrapped in a pancake) and Aloo Chat Puree (potato cookedin a spicy, tangy sauce wrapped in a pancake) duly arrived. Worth the wait, they were tasty and filling; it is good to know the food is cooked fresh to order at Cinnamon Lounge. The neatly shredded side-salad added freshness and crunch and the lemon slice boosted the tang to pair well with the pancake. Though similar in appearance, each dish had its own distinctive flavours and we decided mine was the tastiest, despite being only mildly spiced. I prefer hot, but admit that we eat far too many chillies in our house. Even our salt pot at home contains naga chilli flakes. I too was attracted to a signature dish, Sagathi Dal, until I noticed it included garlic, which can disagree with me. Front of house man, Shah, did not want me to be disappointed and immediately said it would be prepared without garlic. This was a great gesture and meant I could have my dish of choice. Sagathi Dal was available with lamb, chicken or king prawns, which cost a little extra, but were my preference. Fresh spinach was cooked through the dish and it also came with lentils combined with lemon juice and Cinnamon’s special selected spices. There were just three prawns and before you exclaim “that’s not enough!” I must mention that they were gigantic. Each was a meal in itself and I really couldn’t have eaten a fourth if I’d tried. The spices were a little on the mild side, but as the staff are so keen to please, it went back for a few more ingredients to ramp it up. Now that’s service for you. 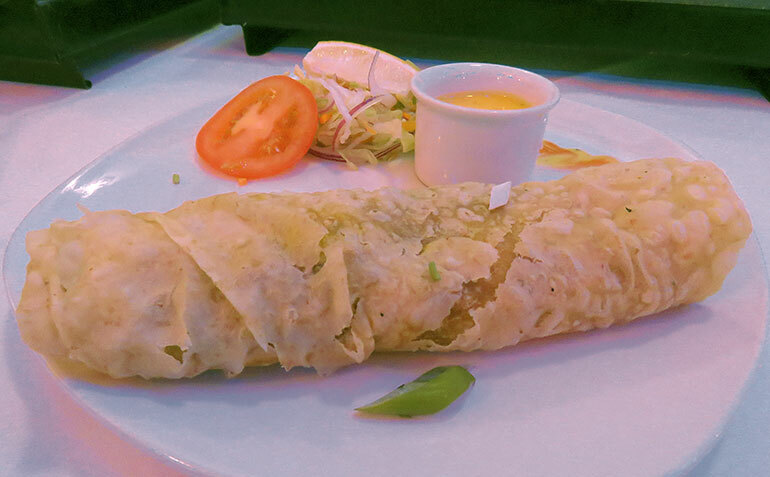 Even though it tasted much hotter, I had to leave a little because I was so full – this was despite Nick and I sharing a Peshwari nan and special fried rice. 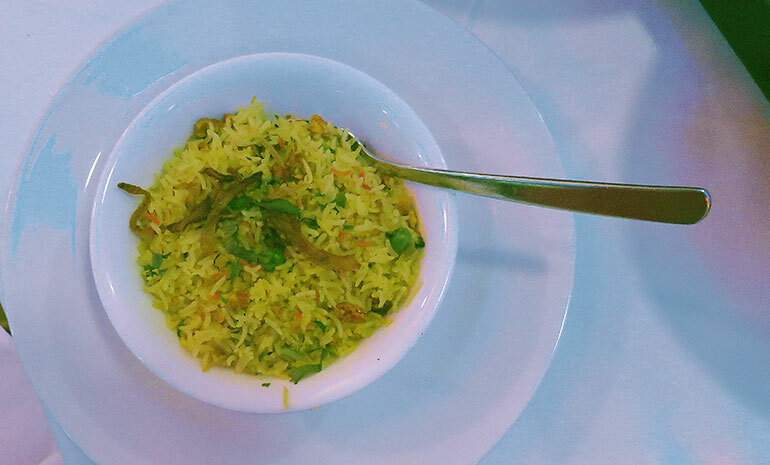 The rice was beautifully light and flavoursome, and the nan was a delectable treat. Sometimes nan bread is heavy and stodgy, but not this one. We were practically fighting over who should have the bigger half. I won, but it wasn’t a victory I was proud of, because I was bursting out of my clothes by the end of the meal and couldn’t contemplate anything more to eat, whereas Nick was able to order himself a bowl of ice cream. boast such a tranquil spot to complement their cuisine. There is an alfresco dining area and large bar.